Planning the ultimate dressy dinner party? Or something more laid-back and casual? 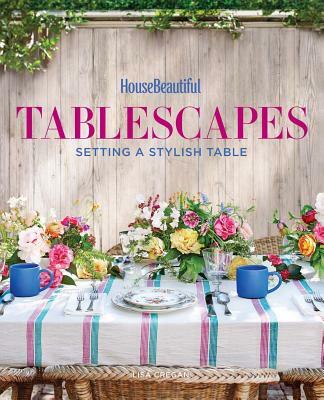 There's an art to tuning your table to the occasion and House BeautifulTablescapes helps you master this often underappreciated skill--whether it's for a Sunday supper, freewheeling garden party, or extravagant holiday soir e. Lavishly photographed, this book explores a stunning range of decorative possibilities utilizing every kind of tabletop d cor imaginable, from an elegantly curling sterling candelabra to jaw-snapping alligator napkin rings to a whooping troop of porcelain monkeys. Lisa Cregan is a regular writer for House Beautiful and has been a frequent contributor to a broad array of interior, garden, style, and entertainment publications. A former resident of the Chicago and New York areas, she now lives in Palm Beach, Florida. Lisa is also the author of House Beautiful Pink and House Beautiful Color: The Perfect Shade for Every Room among other Hearst Books titles. As a leading authority on home design and decoration, House Beautiful reaches 6.3 million readers every month--more than any other shelter magazine. The magazine helps readers achieve rooms that feel right, not just stylish; and living rooms, not showrooms. Inspired by the past, living in the present, and looking to the future, House Beautiful accompanies its readers on their quest to create the house of their dreams.